I have been crafty for a long time. For a brief stint I had the opportunity to work as a professional knitter (which was awesome, btw), and I have been sewing like crazy since I was about 10 and my mom taught me to use her machine. I've sewn dresses and quilts, but my favorite thing to sew is bags. Big bags, small bags, purses, reusable shopping bags made of laminated grocery bags, you name the bag, I've probably made one. But this is not the Jaime Sews blog, this is Crochet Dynamite! And I needed to represent! So I made The London Crochet Bag to carry around my current crochet project and my tool bag. I based it loosely on a bag that my SIL picked up the last time we were in London, which was a slouchy hobo-type bag with a ton of room and a nice big opening, but I didn't want to add a zipper (which was how that bag, and the two dozen bags that I've sewn based on that bag, closed. It's a pretty awesome bag.). So I left it open. Flash forward a couple of days and my frustration level was through the roof. I've been using super fine crochet cotton for pretty much everything right now because I'm in love with bright colors for spring, and the balls kept rolling out of my bag if I wasn't careful how I set it down. Annoying! So I needed a way to close the bag, but I still thought a zipper would stretch my handcrafted cloth weirdly, and would be a pain to install. But a button would be perfect, assuming that I could find a button that would look good with my bag, and would be fairly cheap, since this bag was made using up leftover green yarn from the sushi coasters and black Ducky Momo eye yarn. I didn't have time to head over to the craft store that day, so I began playing with the idea of doing a bubble-type button, stuffed with fiberfill so it would hold its shape. The sphere itself was easy to make, but when I got to the last row, it started to collapse onto itself, which then I smooshed further, and was delighted with the awesome large button shape that it made. The worsted weight yarn made the button dense, and with a few stitches to hold the two sides in place, I was over the moon! It was a button. I wove in the ends and then attached a new tail of yarn to sew it to the bag. It worked like a charm. I made a loop for the other side of the bag to fit my oversized crochet button and none of my yarn has rolled out since. I do not believe that I originated this idea, even though I've never seen it before. It seemed super intuitive and so I am sure that someone made a name for themselves in the '70s by teaching the crochet button technique and that they are super famous for it. So, even though I feel like a crochet genius, I am pretty sure that I have just re-invented a wheel. I used worsted weight yarn with a size G hook. I also tried it with size 3 super fine crochet cotton and a size D hook. Both worked well, but obviously the larger yarn and hook made a larger button. Collapse sphere on itself. Weave in end from magic loop, making sure to tighten it and secure it. Using the tail from R7, tack the flattened disc together in a few places, trying to keep your stitches invisible on the front (good side) of the button. Weave in end. Use an additional piece of yarn (or matching thread) to sew onto your project. Or, attach to a index card and sell on etsy. I am sure you could make a fortune! lol! I have been busting projects out here, and assuming that my patterns are readable, since I think I am using standard crochet abbreviations. Would a key be helpful? I could make one for the terms that I use, and I could also explain the magic loop and how I change colors if anyone would be interested. Leave me a comment if you'd like me to do a future post about that. Otherwise, I'm just going to go along merrily on my way, confident that we all understand what we're doing. Love to you all, my Crochet Dynamos! 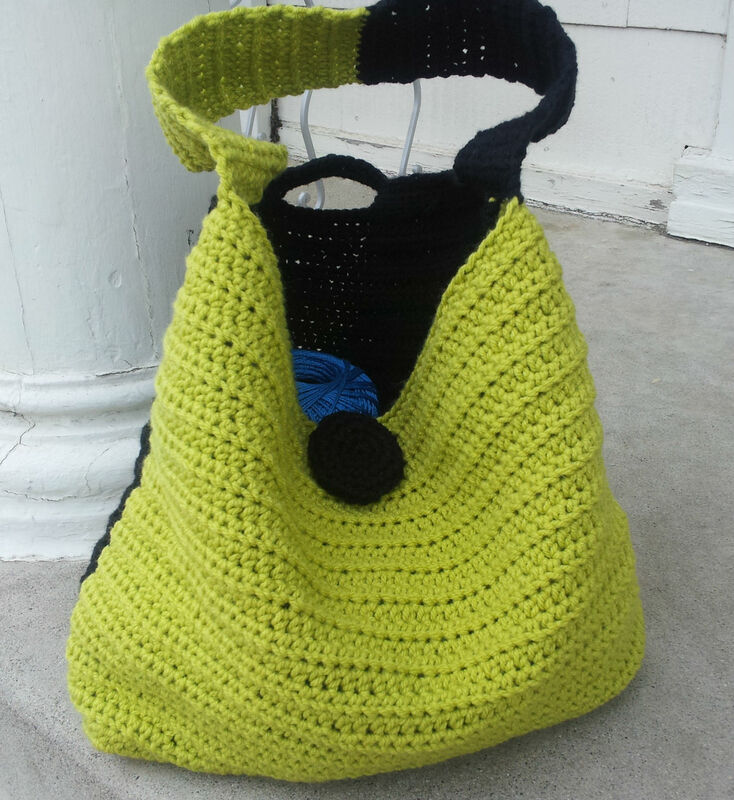 I would also be willing to write out the pattern for my London Crochet Bag, if anyone would be interested. There's no need to do it in funky avocado green and black either, it would look amazing in a heathered gray, or bright purple, or whatever color makes your heart sing. I would love to see your pattern! PLEASE write out the pattern for the hobo bag above! I have just purchased 760 yards of aran weight cotton and it is simply crying out to me to make this bag! I would love a pattern for your London Crochet Bag:). Thanks so much for sharing your amazing talent with us! Hi Delighted Woman! Glad you stopped by! Both here and in another pattern, you used the term "magic loop" in instructions. What is a "magic loop"? Help! Hi Cheryl! Thanks! I do too! I just made your London bag (it was my first time crocheting with an actual pattern written out) and while I learned a lot about myself as a crocheter and reading patterns I just was so confused with the button part. Then I came here and read this pattern and I think I understand it better. I might try to make this button pattern first and THEN try the larger one [at least I think the other one is larger[. I also wanted to thank you for your site. I really like that bag and your pattern is motivating me to try more and to keep at it (as is your site). Thank you!!!! Hi Kara! You just made my day! Once you get the idea of what the button is going to look like in your head, it will make sense (like a beret, it goes out and then snugs back in). Please don't hesitate to email me if you've got any questions! I love your patterns but would like to know if the instructions and in English terms so I can translate them to US. Wish I'd seen these before I spent a fortune on "fancy" buttons for the five scarves I made for Christmas Gifts! could NOT believe the cost of some buttons.! will definitely keep this one!